Superheroes love to hang out with other superheroes. If you had superpowers, wouldn’t you want to spend time with other people who had superpowers and talk about how super your powers are? Of course you would. And apparently, that rule applies even for heroes whose “superpower” is access to bottomless piles of money, as evidenced by the news that Batman and the Green Hornet will be teaming up in a special comic book adventure written by Kevin Smith (who also has a lot of money). 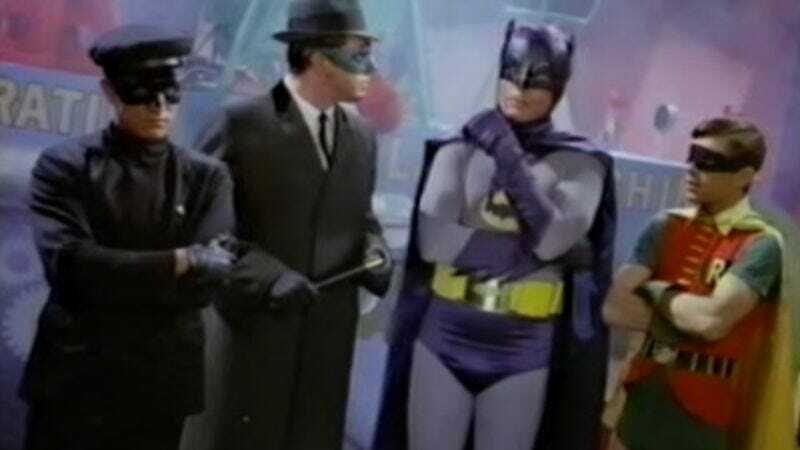 This news comes via The Hollywood Reporter, which also points out that this isn’t the first time the Caped Crusader and the Fedora’d Fiend have teamed up: The two crimefighters worked together in an episode of the ’60s Batman show that starred Adam West. So this will be exciting news for people who have been waiting almost 50 years to see these two join forces again, or just for anyone who was aware of the Green Hornet in his pre-Seth Rogen days. The comic will be a part of DC’s Batman ’66 series, which tells new stories set in the colorful goofball world of the Adam West show, and Smith will write the script with the co-host of his Hollywood Babble-on podcast, Ralph Garman, as well as Ultimate Spider-Man artist Ty Templeton. The comic will debut digitally on May 21, with a print collection coming in June.